With the start of the school term looming in a few weeks, it’s time to start making sure you have everything ready that your child needs. I’m always making various lists to ensure I’m ready but below is really handy checklist that you can print out and mark off as and when you have each item. You can even get your child to help by ticking things off, and reminding you of things you need to get. 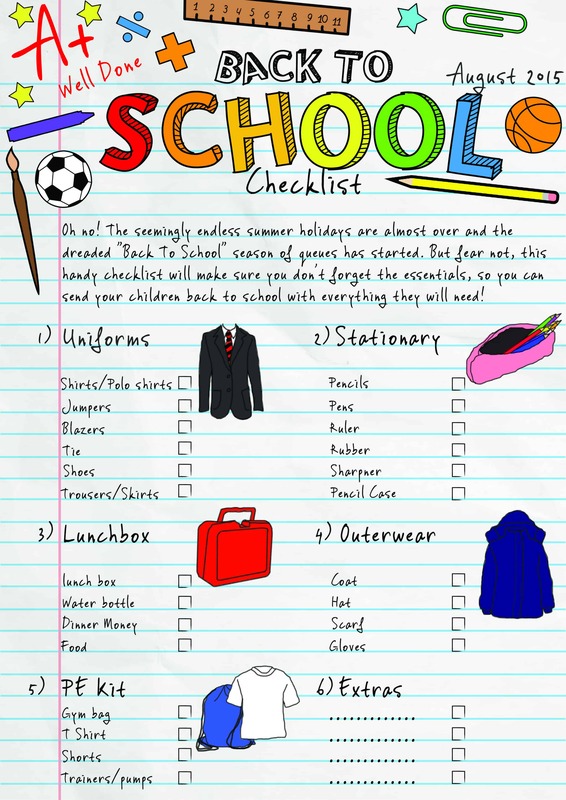 This entry was posted in General and tagged back to school, checklist by Fiona Martin. Bookmark the permalink. Kim Carberry recently posted…This week has been a pain in the bum mostly…. That’s such a great idea, although I’m still in denial that it’s only 2 weeks away. off to print it. not long before they back! woohoo! Eileen Teo recently posted…Have you vote for Walkers Bring it Back? Thanks for this! I am so disorganised this year – this list will be a great help! Need to print off – there are still some things we need!